Sunday night was a night of miraculous musical performance – a revival and revelation of Franz Schreker’s Kammersymphonie in einem Satz (Chamber Symphony in One Movement) and the premier of Unexpected Affinities a Concerto Grosso for Reed Quintet and String Orchestra, by the young composer Graham Cohen. 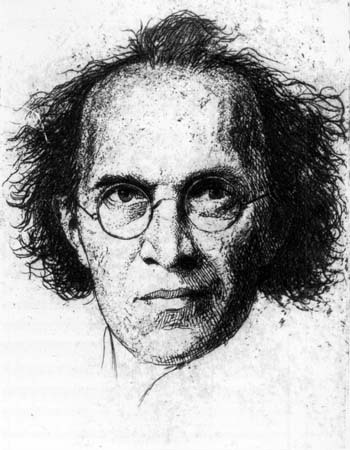 Franz Schreker’s career and his music were suppressed in Nazi Germany and he died in 1934 at 56 following a stroke. He had been stripped of his academic positions and his music suppressed and largely forgotten until the late 20th century – many of his finest works are being revived only now. His crime in the eyes of the Nazis? Franz Schreker’s father was Jewish. That’s all it took to motivate Nazi cultural authorities to destroy his career and bury some of the most brilliant German music of the early 20th century. At the turn of the 20th century in Germany, classical music composition was still heavily under the spell of the lush, romantic, and mythic-themed music of opera-composer Richard Wagner. Schreker was strongly influenced by Wagner, but by the time of the Kammersymphonie first published in 1916, he had moved on musically and developed his own distinctive and eclectic sound. It is amazing it has taken this long to rediscover his music – at the height of his popularity in the 1920s, his operatic work was second in popularity only to Richard Strauss. His music was very successful right up to the 30’s when the Nazis made him the poster-child for so-called “degenerate music”, banned performances of his music and ruined him professionally. The Kammersymphonie belongs to the same period of Schreker’s work as his successful opera, Der ferne Klang, or The Distant Sound. Musica Nova had a live recording made; I bought a copy and it should be out in a few weeks. Here’s the CD part of their website: http://musicanovaaz.com/hear-us/#mnobuycds The CD isn’t up yet, but it will be soon I’m sure. So what about that Kammersymphonie of Schreker? Upon first hearing it made me think of the music of Richard Strauss because of its somewhat free and extended sense of harmony, thematic variance and vivaciousness, and colorful orchestral treatment – but really, Schreker’s Kammersymphonie owes amazingly little to R. Strauss – it’s almost like he is using the same “musical words”; but he’s telling a completely different story. The incorporation of that particular mix of keyboard instruments is brilliantly exploited, never obtrusive, adding a wonderful timbrel dimension. Listen to this piece a couple of times, and you will realize Schreker is not just a forgotten composer, but a forgotten, innovative, original and great composer. It is amazing his revival has taken this long it should have started happening in the 1950s not the 1970s. In any case, it is in full-swing with productions of his operas and orchestra concerts across Europe and America. And Musica Nova’s performance of this sensitive and difficult piece was flawlessly passionate; taking revival to the level of revelation! Also on the program was Graham Cohen’s work “Unexpected Affinities, A Concerto Grosso for Reed Quintet and String Orchestra“. And what is a “reed quintet” you ask? It is a woodwind chamber group comprised of clarinet (Joshua Gardner), oboe (Nik Flickinger), soprano saxophone (Patrick Murphy) bass clarinet (Stefanie Gardner), and bassoon (Joseph Kluesener) – at least that was the line-up for Unexpected Affinities – the exact makeup can vary – but five woodwinds makes up a quintet! These five fine reed players are from the group Paradise Winds and were joined by the Musica Nova orchestra for the stunning premier of Cohen’s Unexpected Affinities – his homage to Schreker, and all the other fine composers banned or banned and destroyed by the Nazis of Germany. The piece was written under the commission of the Selzinck Tikkun Olam Foundation in memory of holocaust survivors Max and Nina Gurin. Unexpected Affinities is in four movements: 1. Adagio, 2. Presto, 3. Quarter-note = 60, Freely and 4. Allegro. It was a lovely piece with about a 16 minute play time. The musical style was appropriately eclectic for an homage to early 20th century German composers – but to be honest I heard references to French Impressionistic music as well. The opening Adagio featured lush string choral-like sections that fetched responses from the reed quintet – a very effective musical conversation. The second movement, Presto, featured light-airy passage work with themes being passed between the clarinet and strings – well crafted interplay of themes. Timber and orchestral color were exploited – I particularly liked a section in this movement were momentarily the Celeste was prominent; nice! Movement 3. really could have been titled – Pastorale – it took me back to my oboe playing days. Here the woodwinds play quasi improvised modal melodies against a more static orchestral background. This kind of thing sounds great on woodwinds – it sounds really great when the wind-players are the Paradise Winds! They were brilliant throughout! Movement 4 featured open string sounds in earnest and simply brilliant passage playing from both Paradise Winds and the orchestra. Bravo! Throughout Cohen displayed a complete mastery of orchestral color – always rich and original, but never muddy and muddled – and while I didn’t hear any obvious quotes, I was reminded of Ravel’s Mother Goose Suite in mvts 2 and 4. More than once, I had to stop taking notes and just marvel at the wonderful sounds of this music! This piece belongs in the permanent orchestral repertoire and I am really glad the concert was recorded and I have a CD on the way. I am looking forward to listening to it over and over to really internalize it. After the concert, I managed to get a bit of time to ask Graham Cohen about his approach to composition. I wondered in his compositional training, at what point did he feel like he was really grasping a foundation in orchestral writing. “I copied the entire Sibelius 4th Symphony, of course using computer music software, and after that I felt like I knew what to do with an orchestra.” We talked about young Mozart – his father had him copy C. F. Abel symphonies for study as well. I asked him if he was at all interested in writing for movies, or even writing serious vocal and dramatic works; opera? “No. No not really, not right now; I’m mostly interested in writing for the orchestra – pure orchestral sounds are still my inspirational touchstone.” I inquired about his plans for the future – “Oh I’d like to go to Julliard Conservatory and study composition after I get though high school.” An accomplished composer – at age fifteen! Oh and I failed to mention in this blog post, the two musical selections reviewed here only got us to intermission. The second half was a presentation by Martin Goldsmith of radio-host fame, of his recent book, The Inextinguishable Symphony, A True Story of Music and Love in Nazi Germany. I have the book and will devote a blog post to that book once I read it! Thanks for the great information on Schreker. It’s mind-boggling how the Germans undermined their whole cultural life with Nazi propaganda. Also, heart-breaking that so many artistic people had their lives ruined and that life in that country was affected forever.